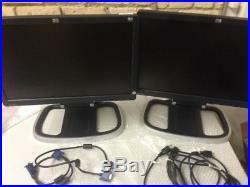 2 x HP L1908W 19 Monitors with upgraded stand. Very solid and stable stand with quick release. The monitor can be removed or mounted to base stand just by sliding a lever. The monitor can also be raised and lowered on the base stand. Tested and in good condition.